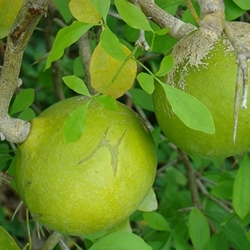 Bel or Bael fruit is known by many names. The fruit contains volatile oils, pectin, and tannins. The wood-ash is rich in minerals and phosphates. The fruit contains riboflavin and is used in numerous products, such as candy, squash, and toffee. It can also be found in the form of its pulp powder and nectar. At Shaman’s Garden we offer dried slices of Bel Fruit. The fruits are traditionally prepared for use as a tea by soaking them in water before boiling and straining them to remove fiber. The resulting liquid is sweetened and drunk. The traditional fruit tea may be diluted with water and ice and a squeeze of lime juice added to make a refreshing drink.